One of the common ways the data is exchanged between applications is XML. XML is a data format , which follows the construct below, a XML document typically has Elements,attributes and a root element , all of which defines the structure of the data. One of the issues/challenges is on how to query the XML data. There are a lot of instances where a certain element/sub-element/attributes of a XML document need to be consumed by other pieces of an application. 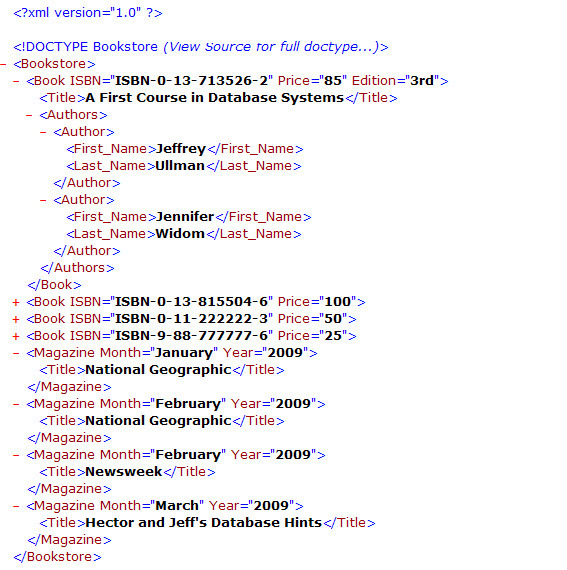 Here is a snapshot of a XML document. There a couple of tools to query a XML document, they are XPath and Xquery. Both Xpath and Xquery allows one to traverse a XML document and returns the required pieces of information from the XML document. There is a tool which is available for download where in one can write interactive XPath and Xquery queries on XML. The tool can be downloaded from http://kernowforsaxon.sourceforge.net/, once the tool is downloaded and installed (the tool requires Java to be present on a laptop/desktop), it is very interactive to use. When one is working with Xpath and Xquery, the queries can be sometimes tough to construct to get the desired result, this tool provides a SQL Server Management studio type experience when writing queries, the query editor does not have intellisense. doc("Bookstore.xml")/Bookstore/Book[Remark]/Title - This Xpath Query works on the XML document "Bookstore.xml" and returns the titles of all the Books which have Remarks. 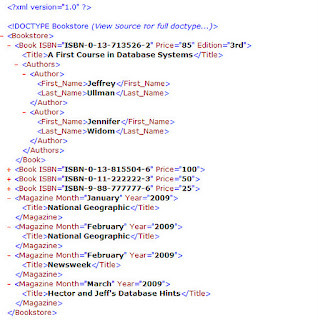 The above expression returns a XML with the root element has Book, the titles of all the Books where the Last Name of the Author is Andrew and the Price of the Book is < 90.